I grew up in London, and, while it was (and is) a city full of fantastic places to explore, the King’s Cross area wasn’t one of those places. In fact, instead of being a “must go” area, it was more of a “must avoid”, with a reputation for drug pushing, prostitution and gangs. Now all that seems to have changed. In fact, the area has been so regenerated that it is unrecognisable. And that can only be a good thing. King’s Cross station has always been a major transport hub, but probably wasn’t famous worldwide until a certain Harry Potter took the train from there to Hogwarts. Not slow to realise that this could be a tourist attraction, there is now a proper Platform 9 3/4 at the station (I say proper, but you can’t actually catch a train from it, as far as I know) and also an extremely busy Harry Potter shop. The platform bit is basically a photo experience, but if you are on the Harry Potter hunt, then this is a must-visit. You essentially queue up, put on a scarf and are photographed pushing your trolley into a wall! The whole thing is nicely organised, with stewards to ensure no pushing. Professional photographs are also taken, although there is no obligation to buy (you view these in the shop). Jess in Ravenclaw scarf at Platform 9 3/4, on her way to Hogwarts! Be warned, however, that the queues are extremely long, and you should arrive early if this is on your list of London must-dos. We waited around 35 minutes this summer, but that was before 10am. By the time we left the queue was extremely long. AND there is also a queue to go into the shop, which seems crazy, especially if you are in a rush and have a train to catch! We came back later to look around the shop and see our professional photos and they had already been erased….. However, we did purchase some hideous Bertie Botts Every Flavour Beans, and my son delighted in trying out everything from grass to vomit flavour (I declined). The Harry Potter Shop at King’s Cross, London – be warned you have to queue to get in here too! But back to King’s Cross itself. If you come out of the back of the station, walk past the swing which looks like it’s in Hedwig’s cage, and walk towards Granary Square, you will see that building works are still ongoing. However, you can still enjoy yourself in London’s newest square, sit by the canal and watch the world (and canal boats) go by, or buy food from the many stalls that appear each lunchtime. We tried delicious falafel and sweet potato chips and were extremely happy with them! There are also some posher restaurants around Granary Square (which is the same size as Trafalgar Square!) along with a number of offices, as well as some fantastic fountains. When we went we were amazed by the numbers of children enjoying themselves by running in and out of these. I sat back in a deckchair with my paper and Robert had a brilliant time. The fountains also light up at night, which makes them spectacular. We felt that this was a kind of hidden gem in London, with a lovely feel to it. It’s built where barges once unloaded their goods and surrounded by buildings including the University of the Arts. But that’s not all of it. There are also many activities on in the area, for kids and the whole family, and including an outdoor sports pitch, and a number of festivals. This weekend, for example, there is a free family weekend celebrating the golden age of steam engines. We visited the House of Illustration, just round the corner from Granary Square, where we really enjoyed an exhibition about the wonderful Quentin Blake, who’s most famous for illustrating Roald Dahl’s books (and now David Walliams’ as well). This finishes on November 2nd, and it was lovely. Robert and I really enjoyed it, although we thought it was a little bit pricey at £7 for adults and £4 for children. So, that’s King’s Cross, even without telling you about the walking tours, viewing platforms and more. It’s well worth a visit, and is a delightful example of how London is always evolving, and often changing for the better! You can read more about what’s on at King’s Cross here. We have many posts on London – please take a look at the London section on the blog! 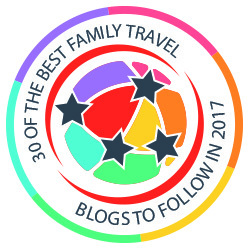 We love writing this blog as a family and would love it if you would please vote for us in the UK Blog Awards. You can vote up to December 19th 2016 and it literally only takes 30 seconds. Just follow this link. And thank you!! What a wonderful idea and perfect for Harry Potter fans.I travel to Kingscross often and did not even know about this platform. I imagine visiting the new platform is a must for all Harry Potter fans! I really want to take the kids to Harry Potter World. Might try this half term! It is fantastic. I – and the kids – would really recommend it! This was a favourite spot in London for my kids! We have been twice – the first time was early in 2010 and there was just the Harry Potter luggage trolley set up on one of the actual train platforms. We were with a guide and would never have found it without him – and there was nobody else around at about 6pm. Imagine our surprise when we turned up at King’s Cross in 2013 and saw how much it had changed!! I know – it took them a surprisingly long time to realise how they could market it properly! I think they got sick of people asking though – must have been thousands of them…. I haven’t been over to this side of London for ages (north of the river to me!). I know my daughter would the Harry Potter connection but I’m not sure about the wait! we’re planning a london trip next year and this is on our 11 year’s olds plan! Nice! The new version looks much better. Some cool additions to just the half trolley. Will have to revisit now. Good news that the area is so much better now. It’s been an area that I’ve always avoided too! I didn’t know about the Harry Potter platform either, sounds like good fun, will have to make a trip there next time we’re in London. King’s Cross is my station when I visit London so it’s very familiar to me. Had no idea about what was nearby: Granary Square and the House of Illustration – fascinating. My son and nephew would go nuts with this! It would be so much fun to go to the station with them and have their pics taken! That looks brilliant for Harry Potter fans. We went to Universal Studios recently and rode on Hogwarts Express.The new Diagon Alley area is totally amazing! My son and husband went and thought the area was amazing too – but the new ride was broken when they went which was more than a bit annoying…. It really does look like Kings Cross has changed for the better over the years. It’s great that they’ve got loads of great new activities for kids and families to go along to. It looks like everyone’s having a fun time pretending to go to get on the Hogwarts Express. Thanks for linking up on Country Kids. Thank you. It really is a much nicer place these days! It is amazing how much Kings Cross has changed, as you say. I went to the station a few months ago but I didn’t know about the fountains and I haven’t taken the kids to Platform 9 3/4 yet – must remedy that. Kings Cross is on our must visit soon list!! You can just add it on the way somewhere else!! I know- it’s such fun, for every age I think!